WE ARE LOCATED IN ALLEY OFF EAST HIGH ST ACROSS FROM DUBOIS BOOK STORE. 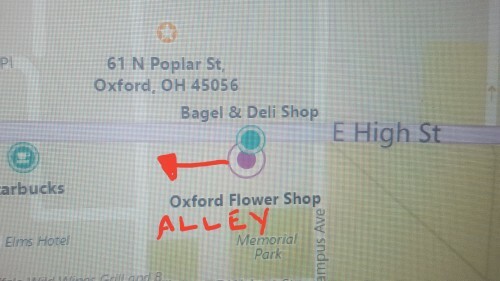 OUR ENTRANCE IS IN ALLEY (OUR DOOR FACES ST. MARY'S CHURCH) OUR ADDRESS IS THE SAME AS BAGEL AND DELI'S BUT THE TWO BUSINESSES DO NOT CONNECT. 119 EAST HIGH ST. PARKING NOT AVAILABLE. BUT YOU CAN PARK ON EAST HIGH ST. OR PULL UP IN ALLEY TO FRONT DOOR!! LOOK FOR THE RED AWNING AND PAINTED FLOWERS ON BUILDING! > Deal of the Day!